High Priestess of the Holy Order of the Blue Cross, Angelica is a healer of incredible divine power. Despite her youthful appearance, she is the most senior member of the Conclave. *Red tiles mark the effective area of a Devotion Skill. Attacks with a staff, with a 20% chance to stun for 1 turn. Recovers ally's Health with healing power. Amount recovered is proprtional to the caster's max Health. Recovers ally's Health, as well as that of another ally with the least Health, with healing power. Amount recovered is proportional to the caster's max Health. Recovers the Health of all allies and grants a barrier and immunity for 2 turns. Amount recovered and barrier strength are proportional to the caster's max Health. Extends buff duration by 2 turns. 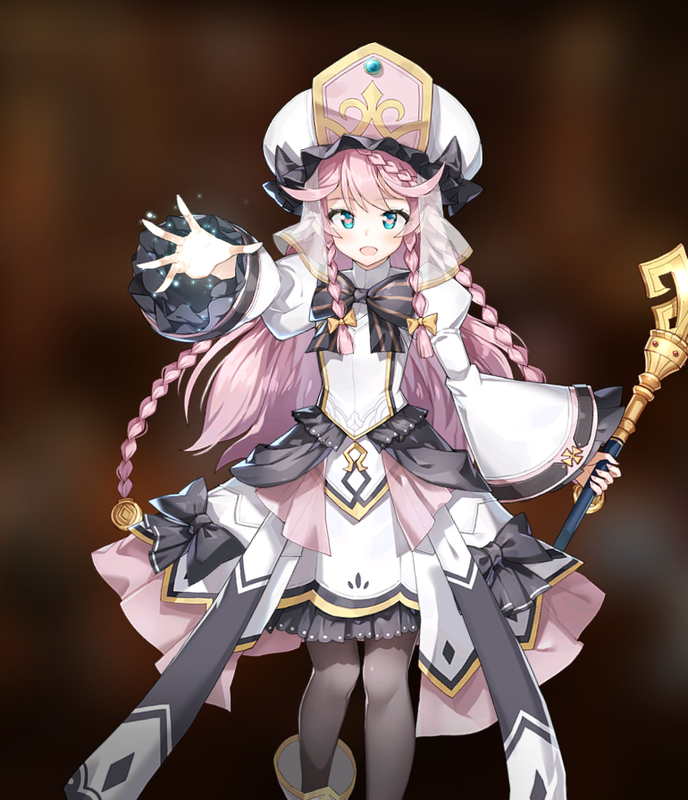 Hailed as one of the best healers currently in the game, Angelica is a Water Soul Weaver with excellent healing and defensive support abilities. With high multipliers and low cooldowns, she can provide allies with near-continuous healing, in addition to barriers and immunity buffs. She is also a strong front-line tank with high survivability, thanks to her high base HP and Defense stats, making her a top-tier hero choice for almost any PvE and PvP content. Angelica has two fantastic healing abilities, one that recovers a large amount of HP for 1-2 allies on a fast 2-turn cooldown, and another that provides AOE healing along with a barrier and immunity buffs for all allies. Angelica’s great base stats, especially after awakening, make her a very tanky healer that can be very difficult for enemies to take down. When using Soul Burn, the immunity buff from Angelica’s third skill, Guide of the Goddess, is extended from 2 turns to 4 turns. This coincides with the 4-turn cooldown of Guide of the Goddess, meaning that Angelica can keep her immunity buff active on the entire team by using Soul Burn every 4 turns. While Angelica’s immunity buff is extremely useful for protecting her team against subsequent debuffs, she lacks the ability to remove existing debuffs. Equipping her with Wondrous Potion Vial allows her to remove one random debuff per turn, but there exist other Soul Weavers with abilities that can remove all debuffs from the entire team. With a base speed of 88, Angelica is one of the slowest heroes in the game. It is recommended to build her with good speed gear, otherwise her slowness limits her effective healing potential and handicaps her ability to keep allies alive. In addition to building HP, Angelica needs a decent amount of speed to make good use of her low cooldown healing skills, so it’s recommended to equip her with a speed set and speed main stats on her boots. Prophetic Candlestick and Idol’s Cheer are solid artifacts choices for Angelica, especially when she is positioned in the front row.